Established in 1987, Rod Kelley Elementary was named after the late Rod Kelley. Mr. Kelley began his public school service as a classroom teacher in 1951 within the Union School District. 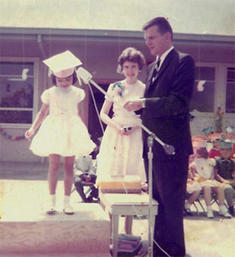 He later taught in the Santa Clara Unified School District and was a principal in the Franklin McKinley School District. He was appointed Director of Elementary Instruction in 1968 for the Gilroy Unified School District, promoted to Assistant Superintendent in 1975 and served as the Superintendent of the Gilroy schools from 1980 to 1983. Rod Kelley school teaches grades Kindergarten through 5th Grade and has taken great pride in making huge strides academically in the past decade. Under the leadership of former principal Luis Carrillo and thanks to the dedication of every single teacher, test scores and academic achievement continue to soar. Mr. Carrillo retired after the 2015-16 school year. Current principal Maritza Salcido continues the tradition of educational excellence at Rod Kelley. It is with the cooperation of educators, students and parents that the recipe for academic success is achieved. One cannot succeed without the other. Rod Kelley School prides itself on ethnic and social diversity and acceptance. It is within these walls that our children learn to embrace differences and understand how important they are in understanding our world. Early success in academics is of the utmost importance.